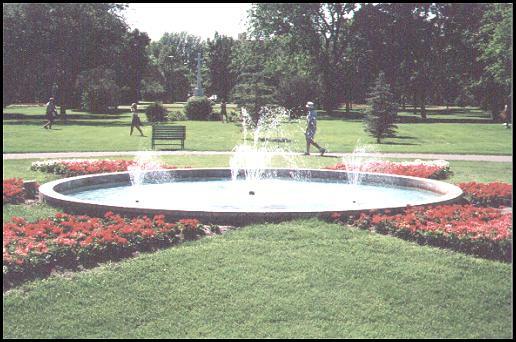 This is Crescent Park in Moose Jaw, Saskatchewan. Not really paradise, just a pretty nice spot to find smack dab in the downtown of a city on the arid prairies. The first home of mankind was in a true earthly paradise, the Garden of Eden. As a consequence of their sin, Adam and Eve were driven from the garden, and ever since there has been a gnawing desire in the heart of each of their descendants to find their way back to that garden. The paradise envisioned by many cultures was an enclosed garden, with trees, flowers, birds and animals, in which one could find peace and rest from all the evils of this life. The Jewish rabbis of antiquity wrote of such a garden and pictured Abraham at the gate to welcome all his spiritual descendants. This traditional understanding was the background for Jesus’ mention of Abraham’s bosom in the account of the rich man and Lazarus. Later on, the dying thief would have readily understood the meaning of Jesus’ promise “Today thou shalt be with me in paradise” to mean such a place. But this is not heaven. Our minds want to skip over the period of time between death and the judgement. The Bible gives only sketchy glimpses of this, but clearly states that the dead will not rise again before Jesus’ return. At that time there will be a bodily resurrection followed by the judgement. Yet it is clear that there is already a separation between the saved and the lost at the time of death. Paradise for the redeemed and a place of torment for the lost. If this is so, why is there a need for the Last Judgement? It seems from the judgement account in Matthew 25 that many of those who found themselves in the place of torment will harbour a conviction that a horrible mistake has been made, that they have been punished unjustly. And those who found themselves in Paradise will have had misgivings about whether they were worthy of such a place. It will be made plain for all to see that each one’s placement was just and their destiny will be sealed for eternity. If Paradise is such a place of beauty and peace, what will heaven be like? “Eye hath not seen, nor ear heard, neither have entered into the heart of man, the things which God hath prepared for them that love him” (1 Corinthians 2:9). We just don’t know, but surely it will be a Paradise beyond our ability to fathom while we live in our earth-bound bodies. It will not be a place of sensuous pleasures, such as imagined by the Qu’ran, but neither will it be a place of sterile, utilitarian beauty. Will there be birds and animals there? We havbe no word either way, but surely there is no harm in imagining heaven in terms of the things we find beautiful and heart-warming today, since heaven will surely not be less than what we can imagine.